A superb 2010 Super 14 with the Stormers paved the way to Springbok honours for Aplon, his debut coming against Wales in Cardiff the following June. After picking up a thrilling brace in a big win over France in Cape Town he retained his place in the squad for the Tri-Nations. A small man, Aplon's elusive running style and express pace make him a dangerous player with the ball in hand, as evidenced by his performances in a glittering Sevens career. 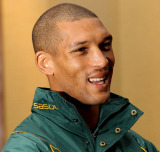 In 2009 he played a key role in the 'Blitz Boks' winning the IRB Sevens World Series.